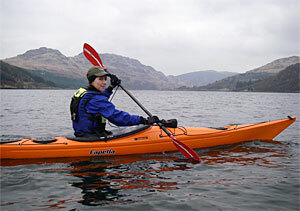 Finally having encountered a break in the rain/wind that actually coincided with a weekend, we headed out for a paddle up Loch Striven again. We set out at the entrance to Glen Striven Estate and headed up towards the top of the loch. I confess to having lost a little conditioning, as attested by my sore bits today. The good thing is, however, that it’s not my arms that are aching, but my torso/side muscles. Hopefully, this means that I was managing a bit of rotation in the old forward paddle stroke. I did try.